Ota Ward Omori Nishi. 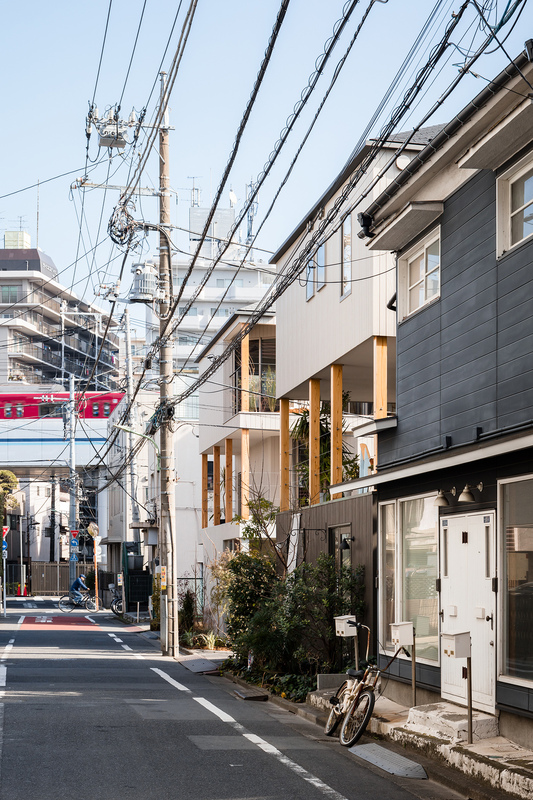 The interval house is located in a residential area close to the Keihin Electric Railway 'Omorimachi Station'. It is a three-story wooden house with the same volume as a 2-storey longhouse with a store "Carrying House" (pictured "Shinkenchiku" 1508) facing through the west side road. Starting with the planting plan of “Omori Lodge” (“Shinkenchiku” 1103), which has been adjacent since 2008, we have been planning to lease several buildings. Designing a "carry house" as a cooperative rental house that opens in the city in 2015. The restaurant owner of the restaurant lives on the upper floor and is familiar with the town. 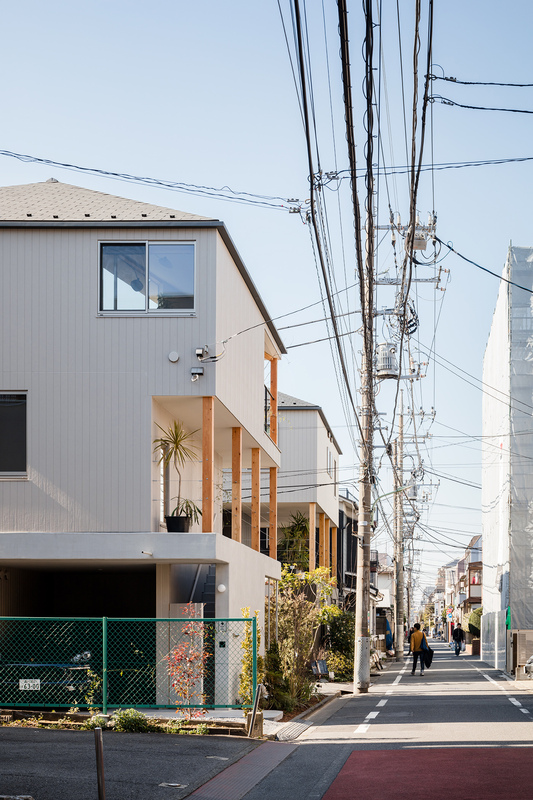 I got the opportunity to design my own house in the face-to-face manner, and I thought to combine the concept of the Omori Lodge series of alleys in the two architectural styles that appeal to the city as opposed to public roads like guardian dogs (placed at the gate or in front of a Shinto shrine). It is an architecture like the garden of Omori Lodge, so to speak. 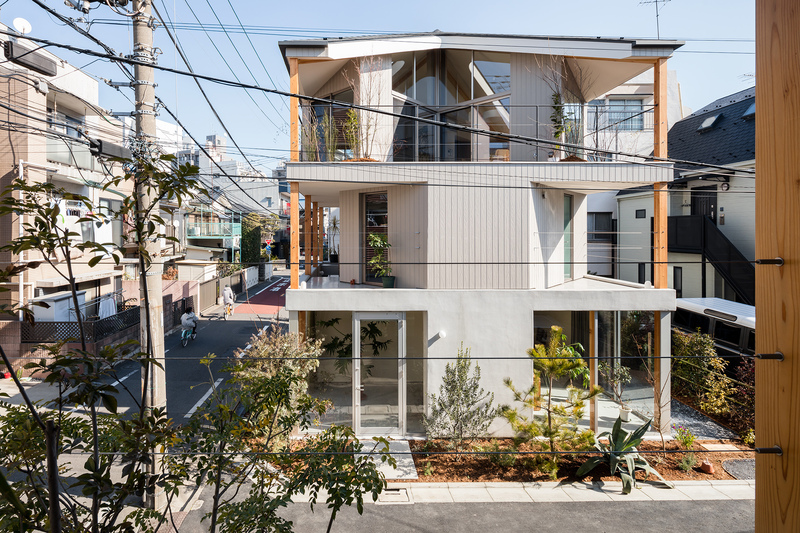 The garden-like architecture creates a reasonable interval with the green and makes each relationship soft. The atelier on the first floor is also used as a nursery (resting area) for indoor green, and in the margin of the site, fruit trees planted in a nursery pot (scissor bowl for producers) are arranged experimentally. These plants will face the city as greens in the alleys until they are used in the future as materials for planting design and construction for which we live. 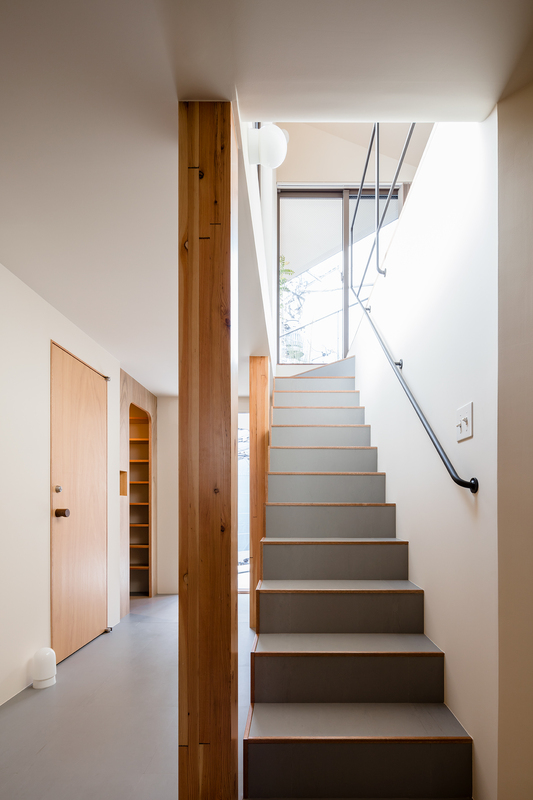 On the other hand, in the upper floor dwellings on the first floor such as the first floor, it is designed to create a space between next house by lack of volume. 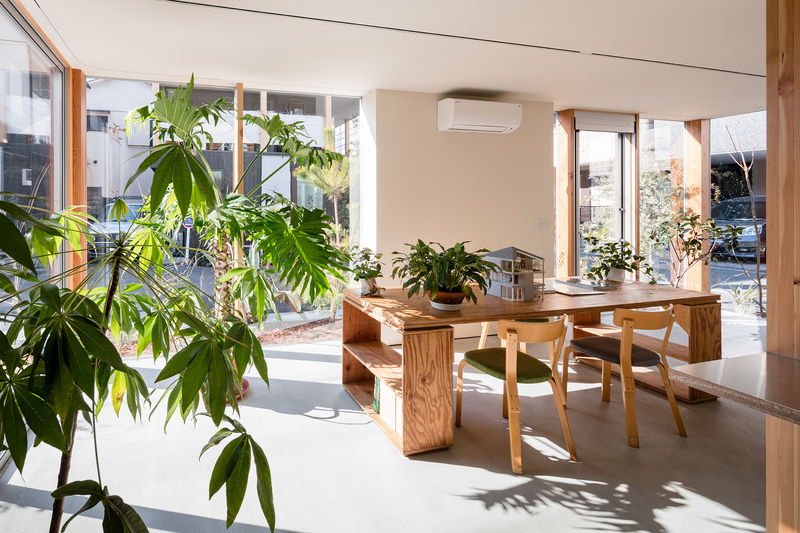 It is connected with the second floor terrace of the house that the missing part carries, and with the design of the exposed column followed, I hope the illusion as if the alley (garden) rises to the third floor terrace aerial garden. 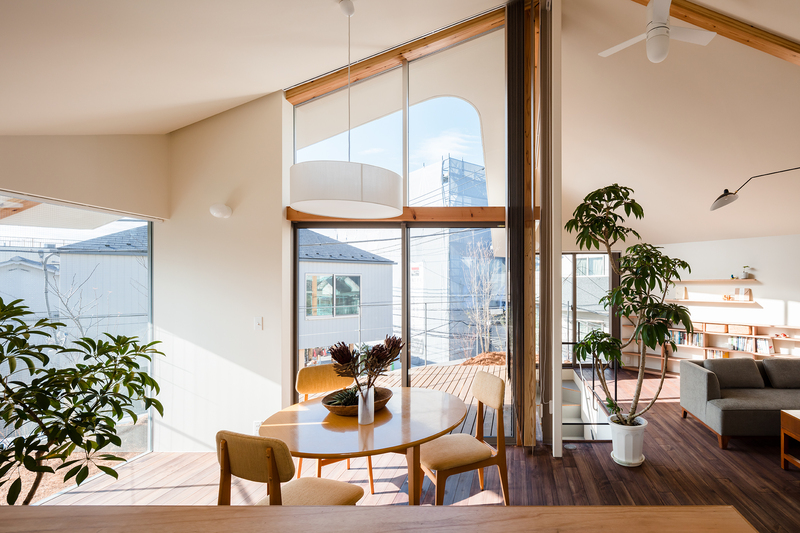 The chip pulls the sunshine into the room, creating a loss of scenery to the surroundings. The indoor flow line follows the plan of 45 degrees along the ridge line of the treasure roof, and leads to the living space while recognizing the outside. As a result, on the 3rd floor space that has become a zigzag, through the terrace and the garden, it creates a comfortable rest space by creating a gap and contact with the surroundings in the direction you want. Time interval with the carrying house. The spatial distance from the opposing city. Between work and life. The feeling that there is a house as a place of rest during the stagnation thought fades. We call this architecture interval house with such a meaning. First floor residence interior view. First floor residence interior view. The lack of a pyramidal roof pulls sunshine into the room.